The aridity, population growth, agriculture and industrial activities threaten the water resources in the United Arab Emirates (UAE). In UAE, groundwater quantity is reduced and its quality is also deteriorated due to the scanty of rainfall and over pumping for different uses. The deficit of groundwater is met by desalinated water and reused of treated wastewater. Agricultural activities have negative impacts on water resources and this causes reduction of groundwater quality as the agriculture the main land use in the UAE and it accounts for more than 70% of groundwater use. The treated wastewater is an alternative source for agricultural activities. To improve the current water situation, a national water resources strategy has been prepared and implemented to assist in achieve this target and maintain the country’s water security. This paper intends to give an overview of water resources in the UAE with emphasis on challenges facing the management of these resources. The shortages of water resources in the United Arab Emirates (UAE) became a big concern in arid and semiarid zones. Fears and anxieties are increasing due to heavy abstractions of conventional water resources for mainly agricultural activities. For example, more than 120 million trees were planted in Abu Dhabi Emirate . As a result, the natural water availability in UAE becomes less than 200 m3/capita . 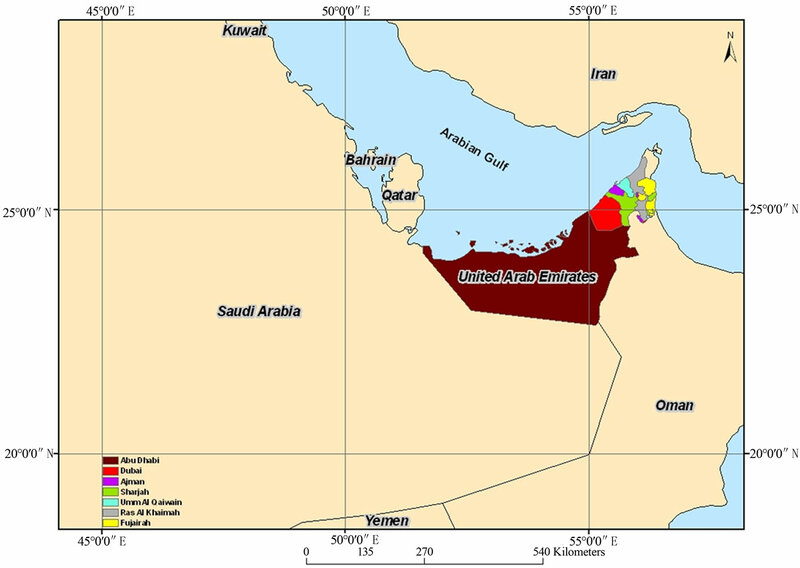 UAE is located within the arid zone to the southeastern part of Arabian Peninsula (Figure 1). The arid zone is characterized by low amount of rainfall and high rate of evaporation. Based on rainfall statistics of different emirates from 2000 to 2006, the lowest and highest amount of rainfall received in Abu Dhabi Emirate was 2.8 mm in 2001 and 153 mm in 2006, respectively. However, in Dubai, the lowest and highest amount of received rainfall was 8.8 in 2001 and 112.2 mm in 2004, respectively. The lowest and highest amount of received rainfall in Sharajah Emirate was 9 mm in 2001 and 168.21 mm in 2006, respectively. The eastern and northern parts of the country received the highest amount of rainfall during the period of 2001 to 2006 due to its location near the recharge areas. The amount of rainfall in the northern and eastern parts of the country varies from 31 mm in 2001 to 145.5 mm in 2006 (Figure 2) . Heavy periods of rainfall could happen every 10 years . While the rate of evaporation can exceed 2000 mm/year . The rapid immigration to UAE is evident for the increment of inhabitant number. It reached about 5.065 million inhabitants in 2006 . It is clear that the loss of water through the evaporation process is more than rainfall and this magnifies the problem of water shortages. The population growth accompanied with accelerated economical growth requires sufficient quantity of water which will stress the water resources in the country. UAE was extremely dependent on groundwater production from major aquifers for water supply. The production of groundwater is reliant on the amount of rainfall which is scarce. The consumption rates of water resources have been exceeding the natural recharge. This condition of scarcity has created imbalance between the input and output of the water to the system and results in deterioration of groundwater quality and introducing the seawater intrusion in the coastal areas [7,8]. Desalination plants have been established to cover the shortages of conventional water resources and to meet the high demand of water for domestic, agricultural and industrial purposes. In addition, plants for wastewater treatment are launched in different parts of the country to reduce groundwater production and reduce even the stress on costly production of desalinated water. Significant efforts were started to the assessment and management of water resources such as implementation of sustainable water resources strategy in order to augment the groundwater storage and cope with increasing demand. Depletion of groundwater resources accompanied with increasing water demand in the UAE due to the population growth which put the country in stress and limited availability of natural water resources. Shortages of water resources threaten the sustainability development and classified the country as one of the poorest countries in the world in availability of water resources. In order to elevate and improve the quantity and quality of water resources, periodic assessment is essential to overcome the problems associated with water resources. This present study is aimed to assess the water resources in the country during the period of 2000 to 2006 and discuss the constrain that facing the sustainability of water resources. This will help the decision makers to provide a solid and proper management for existing water resources and even find other alternative resources for water resources. Collective Data of Abu Dhabi Water and Electricity Authority (ADWEA), Dubai Electricity and Water Authority (DEWA), Sharjah Electricity and Water Authority (SEWA) and Federal Electricity and Water Authority (FEWA) from 2000 to 2006 were used to meet the objectives for this study. Figure 1. Map showing location of the United Arab Emirates in the Arabian Peninsula. Figure 2. Total amount of rainfall for the UAE in mm for the period of 2000 to 2006 (Ministry of Economics 2007). Water resources assessment is the first priority for decision makers in providing the potential solution for shortages and deterioration of water resources. This assessment will identify the current status in which the trend of water production will be planned for coming years. Water resources can be classified to conventional and non-conventional water resources. Conventional water resources depend on rainfall amount and it forms groundwater, falajes, springs and flash floods. However, non-conventional water resources rely on human intelligence to obtain water from different sources than the natural resources. Examples of non-conventional water resources in UAE are desalinated water and treated wastewater. Previously, the country mainly was dependent on conventional water resources and in particular groundwater, but at present the country relies on nonconventional resources and in particular desalinated water. The detailed assessment of major water resources in the UAE was also discussed and below summarized. Surface water is one of the conventional resources and the availability of surface water in the UAE is limited and temporary because of low rate of rainfall (see Figure 2) and high evaporation rates. Therefore, the perennial rivers and lakes are totally absent in the country. The accumulations of surface water might observe in the southern part of Oman Mountains  and northern part of Oman Mountains in eastern and northern parts of the UAE. Some of surface water could be received from western slopes of the Oman Mountains .The types of surface water that exist in the UAE include seasonal floods, springs and falajes. Floods might occur in association with strong, short lasting, rain storms in the eastern and northern regions of the country. Seasonal floods is formed near the mountainous areas and the formation may be attributed to the high amount of precipitation in these areas comparing with other parts of the country and due to the low porosity and permeability of massive igneous and metamorphic rocks. The estimated surface water in the UAE were about 39.6 billion gallon/yr (0.15 billion m3/year) . At present time, there are 114 dams of different sizes to protect flooded water and to increase the groundwater recharge in the area with approximate capacity of 31152 million gallons . The Ministry of Environment and Water (MEW) will build another 68 dams with a capacity of 26400 million gallons. Out of these new planned dams, 37 dams will be built in the eastern region of the country. The total surface water stored behind 65 dams belonging to the MEW was 56083.95 million gallons until December of 2007. Beyond this, 49435.58 million gallons stored in 10 dams called Albeeh, Tawiyeen, Ham, Alowais, Adhen, Wuraya, Showkah, Hadhaf, Gulfa and Baseerah (Figure 3) . The total surface water stored in the dams of Fujairah, Ras Al Khamiah, Ajman and Sharjah Emirates from construction until December of 2007 were 28846.488, 23129.7264, 3799.5672 and 303.864 million gallons respectively (Figure 4). Most of the surface water stored in Fujairah Emirate where received the highest amount of rainfall. As moving from east to west, the accumulated surface water decreased as in Ajman and Sharjah Emirates. The surface water is not significant source as the availability of surface water in UAE is associated with intense periods of rainfall which occurs in the area rarely. Also, it is noted that the presence of surface water in the country as seen from Figure 3 is concentrated in the northern and eastern parts of the country where the amount of rainfall is higher than other parts of the country. Figure 3. Total accumulation surface water (million gallons) in main dams since construction of the dam until December of 2007 (MEW 2008). Figure 4. 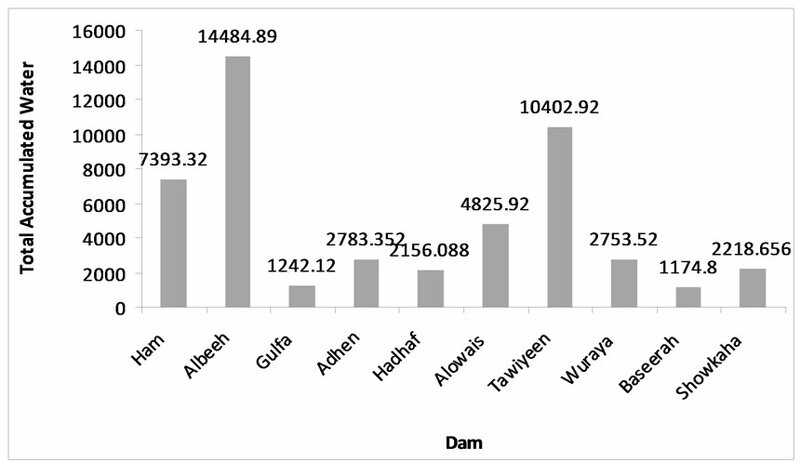 Total stored surface water (million gallons) in main dams of Fujairah, Ras Al Khaimah, Ajman and Sharjah Emirates since construction of the dams until December of 2007 (MEW, off. Comm., 2008). Figure 5. 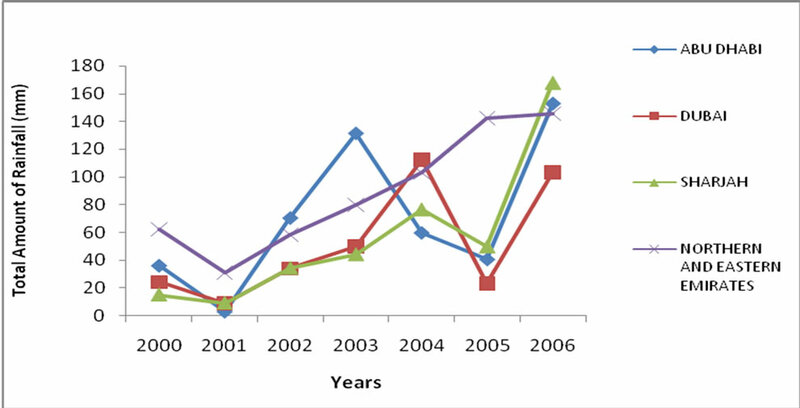 Groundwater production in UAE by different water authorities from 2000 to 2006. 2001, and the production of groundwater in Abu Dhabi in 2006 was the lowest comparing with other emirates. It is obvious that Abu Dhabi Emirate managed the water resources by stopping groundwater abstractions and relying on desalinated water to increase the level of water table and improve the quality. The reduction in groundwater in UAE over the time is an indication for reduction in groundwater quantity and quality. The groundwater dependency in UAE is differing from one year to another and from one emirate to another. The groundwater dependency (percentage of groundwater production relative to total production of groundwater and desalinated water) in Abu Dhabi, Dubai, Sharjah and eastern and northern parts of the UAE is about 14.05%, 6.27%, 47.22% and 64.98% in 2000. 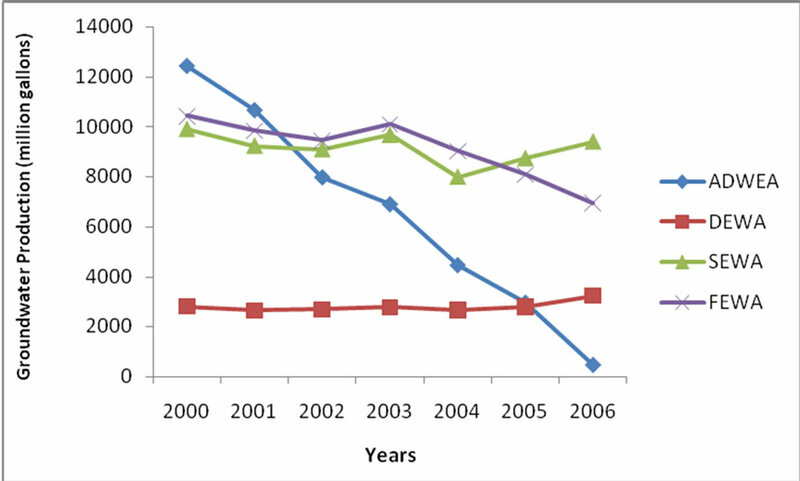 However, the groundwater dependency for Abu Dhabi Emirate decreased significantly to 0.27% in 2006. The dependency of groundwater for Dubai, Sharjah and eastern and northern parts of the UAE has been also decreased to 4.3%, 33.22% and 37.89% in 2006 respectively (Table 1). The dependency on groundwater in UAE is decreasing over the time and this indicates that at the present time the country relies on non-conventional water resources such as desalinated water and treated water. The total amount of groundwater uses is high when it compared with annual recharge and the total amount of groundwater production is estimated to be 237600 million gallons where the recharge to the aquifers is about 33000 million gallons . This would create deficit of about 204600 million gallons in groundwater reserve. This deficit is covered by increasing the production of costly desalinated water. The huge difference between groundwater abstractions and recharge points to increase water demand in the country due to population growth which accompanied with economic development and political stability. The big difference between recharge and groundwater consumption is also created by agricultural practices which account for about 70% of total groundwater consumption . Groundwater reduction and deterioration hinder the sustainability of this source to be considered as the main source of water resources in the country. The UAE is supporting the deficit in conventional water resources with the conventional water resources and in particular the desalination of seawater and brackish water. Table 1. Groundwater dependency (%) of different water authorities in UAE. The UAE with Saudi Arabia and Kuwait is considered one of the largest users of desalinated water in the region, and these three countries are accounting for 77% of the total of the region . The desalination technology started in UAE in 1976, when the first plant was established in Abu Dhabi with a capacity of 66000 gallons/day. The establishment of desalination plant since that time indicates that the water scarcity is an old problem and the severity of this problem is increasing annually. Over the time, the water demand for domestic, agricultural and industrial is increasing, so new desalination plants are being constructed in the country . A total of 36 desalination plants were built in UAE by the end of 2006. Beside this, there were 10 main desalination stations belonging to FEWA and operating in the northern and eastern parts of the country . Also, there were 8, 5 and 12 main desalination stations in Abu Dhabi, Dubai and Sharjah, respectively [13–16]. In addition, there were 2 plants to desalinate groundwater in Umm Al Quwain . The production of desalinated water is increasing over the time to provide sufficient quantities of water for different activities. Since 2000, the UAE continued to depend on groundwater and treated water besides desalinated water to meet the increased demand of water for different purposes. The total production of desalinated water in UAE was 134412.8 million gallons in 2000 and it increased to 277942.14 million gallons in 2006. The desalinated water that produced by ADWEA, DEWA, SEWA and FEWA was 76015, 41703, 11075, 5619.77 million gallons respectively in year 2000. In 2006, the production of ADWEA, DEWA, SEWA and FEWA was increased to 176457.1, 71703, 18438.54 and 11343.5 million gallons respectively (Figure 6) [13–16]. The increased of desalinated water production observed in all emirates. The desalination production is higher in Abu Dhabi and Dubai due to economic developments in both emirates and rapid immigrants to Abu Dhabi and Dubai seeking the political stability. Figure 6. 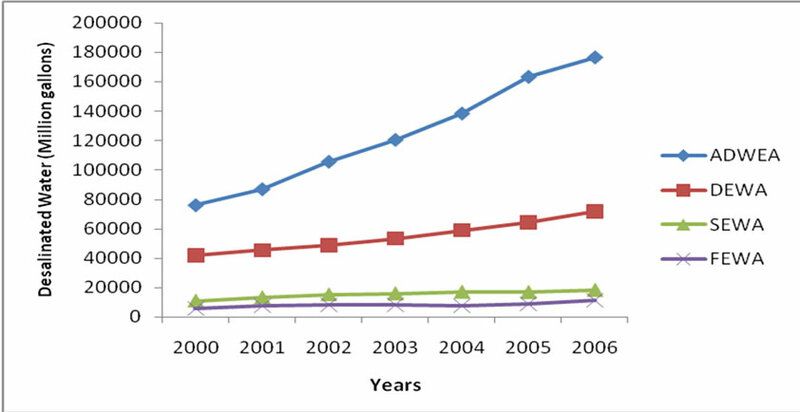 Production of desalinated water in UAE by different water authorities from 2000 to 2006.
of groundwater. Water production by ADWEA is mainly depending on desalination and its dependency increased from 85.95% in 2000 to 99.73% in 20006. Also, the water production of DEWA is mainly desalinated water with dependence percentage of 95.7% in 2006 comparing with 93.73% in 2000. However, the dependency of desalinated water of SEWA and FEWA in 2000 was 52.78% and 35.02% and it increased to 66.22% and 62.11% in 2006, respectively [13–16]. It is obvious that the eastern and northern emirates of the country are depending in both groundwater and desalinated water, whereas both Abu Dhabi and Dubai Emirates mainly rely on desalinated water. The production of groundwater in eastern and northern emirates is relatively high due to the closeness from recharge area, but the dependency in groundwater in those areas will decrease with the time and depend on desalinated water will increase to cover the deficit on groundwater as the population of the country is increasing rapidly. Treated wastewater is one of the non-conventional water resources and it is considered supportive source for fresh water that used for the irrigation activities which account for 70% of groundwater production in the country . The percentage of treated water accounted for 5.1% of total water production in UAE in 1995 . Due to the shortages in conventional resources, the production of treated water is increasing 10% annually in which this type of water can be utilized for domestic purposes after assurance of being suitable for use . Numbers of wastewater treatment plants were increased in the country. There are 19 plants in Abu Dhabi Emirate with total capacity of 233502.98 million gallon/year . Dubai Municipality produced 19008 million gallons of treated water in 2000 and this production jumped to 37512.424 million gallons in 2006 . The percentage of treated water production in Dubai is increased by 97.4% during the period of 2000 to 2006. Also, there are 7 wastewater treatment plans in Sharjah Emirate with total capacity of 42.438 million gallon/day. However, the total production of treated water from all seven stations in Sharjah was 40.9741 million gallons in 2006 . Ajman Emirate is in process to launch the project of Ajman sewage in which will be managed by Ajman Sewage Services Limited Company . However, there are 6 stations in Fujairah Emirate managed by private companies and these plants will stop the operation after starting the main station for treated wastewater. The experimental operation of this station was started in May of 2007. The estimated production of this station is 3.168 million gallons daily in 2007 and this production will increase daily to 7.6296 million gallons in 2036 . Increasing the production of treated wastewater is a result of shortages in water availability which could harm the agriculture activities. Most of treated water in the country is used for landscaping and irrigation as the agriculture practices are one of the main land use in the area. Periodic and regular water assessment will lead to determine factors affecting the sustainability of the water resources in which remedial measures and options to close the gap between water supply and demand will be suggested to the decision makers. Water resources in UAE are facing serious threats that might affect the sustainability of water resources in near future. The assessment of water resources in the country indicated that there is a huge increase in desalinated water and a significant decrease in groundwater production for domestic sector and other sectors. This clearly shows that at the present time, the water resources are limited to nonconventional water resources. There are many factors hindering the sustainability of water resources and these factors include the natural location of the country within the arid zone, groundwater deterioration, population growth, agriculture and industrial activities, and tourism. The location of the country in the arid environment will increase the loss of surface water that stored after period of heavy rainfall. About 75% of rainfall is lost due to evaporation  and the groundwater near the surface is also subjected to the evaporation process . In addition, rainfall can evaporate before reaching the ground. The infiltrated water will be affected by evaporation in which the quality of groundwater will be deteriorated [8, 28]. The deterioration of groundwater of major aquifers in UAE is noticed due to significant increase of water demand in the country. Also, rainfall rate affected the water resources in UAE and in particular groundwater production. It is noticed that both Abu Dhabi and Dubai is receiving the lowest amount of rainfall and as a result, the production of groundwater in both emirates are the lowest comparing with other parts of the country which are receiving the highest amount of rainfall and the production of groundwater is the highest. 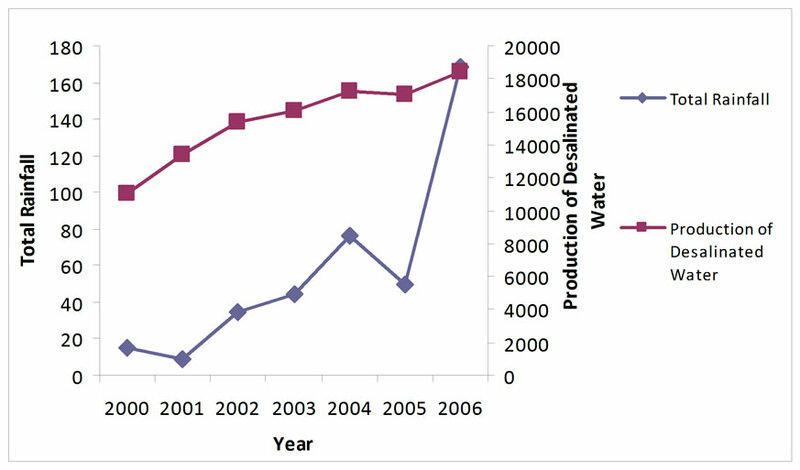 The direct relationship between the amount of rainfall (mm) and production of desalinated water (million gallons) is noticed in Sharjah Emirate (Figure 7) and this supported the argument that the amount of rainfall does not meet the need of the country as the withdrawal from major aquifer exceeds the annual recharge. Groundwater salinity, which developed over the time, is one of the problem that facing the sustainability of conventional water resources in UAE. The salinity of groundwater restricts the groundwater utilization and this will increase the dependency on desalinated water as main source of water. Different sources of groundwater salinity are encountered in different locations of the country. The salinity of groundwater is changing over the time as it was tripled in the southern and northern parts of the UAE during the period of 1985 to 1996. Also, the salinity was doubled in the central part of the UAE [7,29]. The sharp increase of water demand in the country may be linked to the economical, industrial and agricultural developments which might attract more immigrants to the country. In addition, the recent birth rate in the country will increase the population and this must accompany with increase in water production. The population growth is the main factor affecting the water resources because the human being is influencing economical, agriculture and industrial activities. 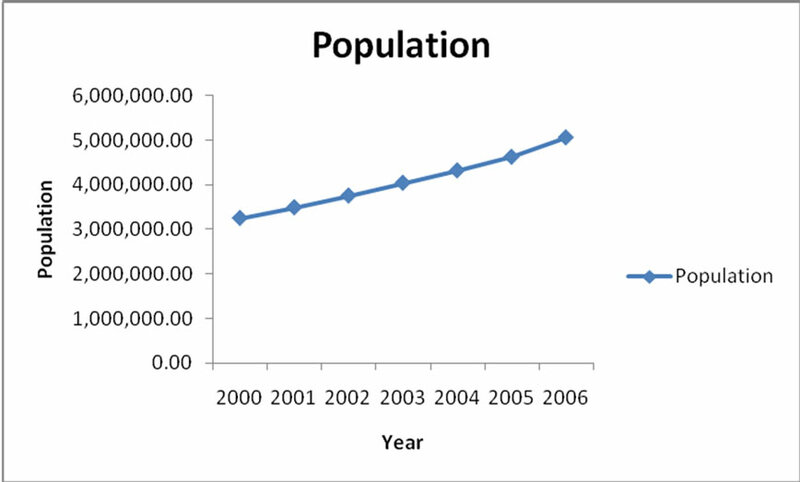 The UAE population increased from 3247000 in 2000 to 506500 in 2006 (Figure 8) . This also required increasing the water production to provide sufficient quantity of water for each one in the community and also for different activities. The production of desalinated water is increasing annually. 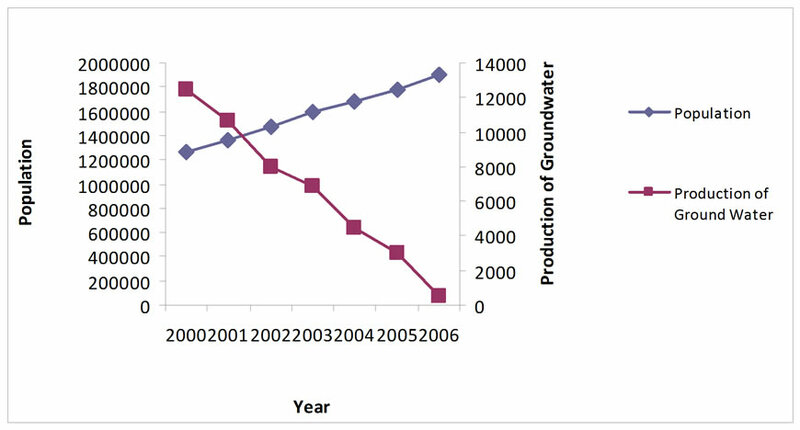 However, groundwater production is decreasing. The deficit in groundwater production is covered by increasing the production of desalinated water which will increase the financial resources because of the cost of the operation and maintenance of the desalination plants. Figure 7. The relationship between total rainfall (mm) and production of desalinated water (million gallons) in Sharjah Emirate from 2000 to 2006. Figure 8. Population of UAE from 2000 to 2006. Figure 9. Relationship between groundwater production (million gallons) and population in Abu Dhabi Emirate from 2000 to 2006. Figure 10. Relationship between groundwater production (million gallons) and population eastern and northern parts of the UAE from 2000 to 2006. Figure 11. The trend of increasing the desalinated water (million gallons) with population in Abu Dhabi Emirate from 2000 to 2006. 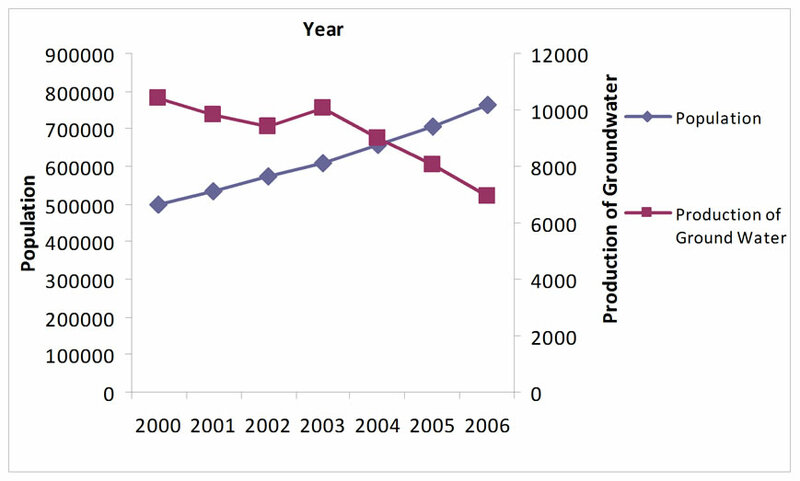 The decrease of groundwater production in Abu Dhabi Emirate is significant comparing with the population growth in the emirate (Figure 9) and the trend of decreasing groundwater production with increasing population is observed in eastern and northern parts of the UAE (Figure 10). 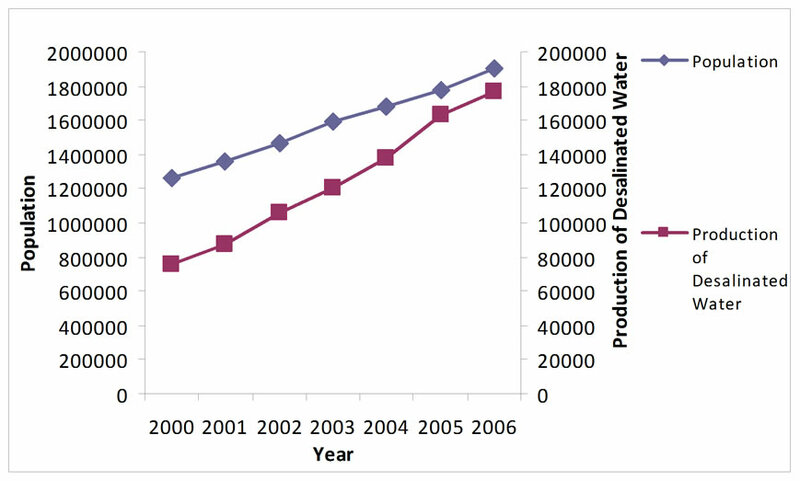 On the other hand, the production of desalinated water and population is increasing over the time (Figure 11) to meet the demand in which this demand has been affected by groundwater production due to the limited availability of groundwater in UAE. Agriculture activities are one of the factors that affecting the quality and quantity of groundwater in UAE. Agriculture practices consume more than 70% of total groundwater production  and this support that the agriculture is the main reason hindering the sustainability of water resources in UAE. Using different types of fertilizers and pesticides for agriculture lead to groundwater contamination. Increasing the level of nitrate (NO3-) concentrations is observed in south of Dubai, Al-Ain area, west and east of Abu Dhabi Emirate such as and eastern parts of UAE [29–31]. Also, direct relationship between groundwater production and the cultivated areas is found, and this means that as cultivated areas increased, the production of groundwater increased as it noticed in eastern and northern parts of UAE and vice verse (Figure 12). Figure 12. 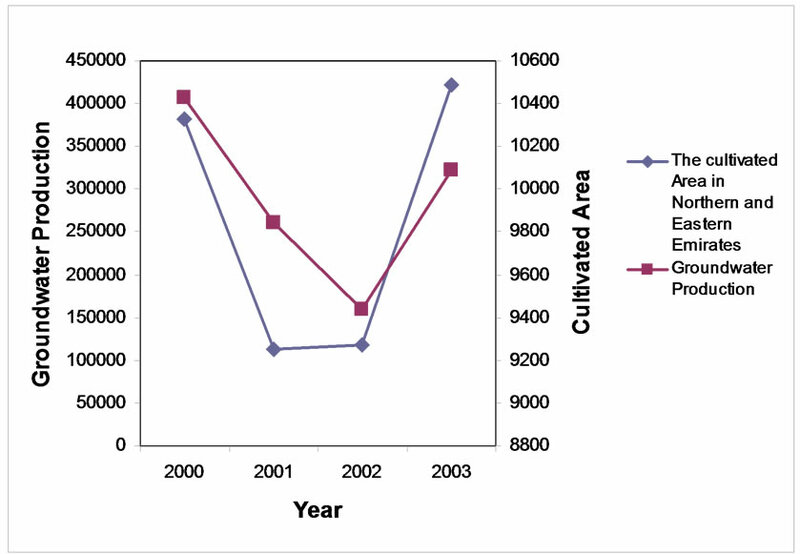 The relationship between groundwater production and the cultivated area in eastern and northern parts of UAE (Emirates Center for Agicutlure and Environment Information 2007). Figure 13. Number of manufacturing establishment in Dubai is increasing with desalinatd water production (million gallon) is increasing over the time. (Statistics Center of Dubai 2007). Table 2. Predicted water quantity for tourism in Abu Dhabi from 20110 to 2015. UAE, which is desalination plants, has been not functional during some of those oil accidents . These incidents may invade the adjacent coastal aquifers to Gulf of Oman and Arabian Gulf and in particular the Eastern Gravel Plain and Quaternary aquifers. Tourism could affect water resources and it plays a significant role in increasing water production due to the development of this sector in UAE. It is also predicted that number of tourists will increase in UAE due to the heavy launch of different attraction activities in different emirates. The number of guests in Abu Dhabi hotels was 113183 guests, and this number expected to reach 3003047 guests in 2015. Also the number of reserved rooms in Abu Dhabi Emirate hotels was 2436756 nights in 2006 and these nights expected to reach 6244544 nights in 2015 . This requires huge consumption of water, and providing suitable quantity of water for each guest in each night is essential for all hotels. It is estimated that the average water consumption for one room per a day is 209 gallons . Therefore, the predicted total water quantity for tourism in Abu Dhabi will be 887.2, 984.9, 1078.9, 1164.82, 1240.04 and 1305.1 million gallons in 2010, 2011, 2012, 2013, 2014 and 2015 respectively (Table 2). These quantities of water are increasing continuously and this will increase the stress on water resources as the tourism is important in increasing and improving the economy of the country. Other issue that might affect the development of water resources sector is water data scattering and unavailability of well-documented data. Lack of information and data management might affect the results and interpretation of any investigations. The water data in UAE is distributed in Ministry of Water & Environment, ADWEA, DEWA, SEWA, FEWA, Municipality of each emirate, EAD, NDC, Water Department of Umm Quwain Emirate and ADSSC. It is highly recommended to have the water data in one organization and in particular MEW. Well organized data and locating these data in one place will ease the annual assessment and will help to provide solid and coherent information for future needs. Also, collection of the data will build a data base for the country which will help the decision makers in emergency situations. Great efforts were taken by the government to face the water scarcity. The government of UAE implemented the national environmental strategy for water resources in order to improve the hardship situation of water resources. This strategy is aimed to plan and manage water resources through implementation the policy of water management. The strategy also focuses on development of water policies and capacity building. Groundwater can be managed and developed through conservation, documentation and licensing of groundwater withdrawals. Additionally, desalination technology can be assessed to know the impact of increasing the desalination productions on the marine environment and by building a national capacity in desalination . Water resources of the UAE are facing severe situation. Assessment and determination of factors affecting the sustainability of water resources are very important tools for decision makers to provide suitable measurements for the deficit of water resources in the country. The water resources status at the country is summarized as dependence on desalinated water. On the other hand, groundwater production is decreasing over the time, in which the quantity and quality of groundwater is deceasing and deteriorating respectively. Groundwater availability in UAE has been reduced drastically due to the heavy pumping of groundwater and low quantity of recharged water, in which this quantity does not cover the amount of withdrawal from the aquifer. The production of treated wastewater is growing and mainly utilized at the present time for landscape purposes. There are many factors affecting the sustainability of water resources in UAE. These factors include: the natural location of the country in the arid zone, groundwater deterioration, population growth, agriculture and industrial activities, and tourism. Water demand is increasing annually due to the economical development that witnessed in the UAE during the last few years. Rapid infrastructures and urban/rural expansion have caused dramatic changes in water resources. The desalination and wastewater treatment plants helped to reduce the stress on conventional water resources which might improve the quantity and quality of groundwater. The water data to be compiled in one organization is essential to save the time of researcher and decision makers in case of emergency. The author would like to extend his great appreciations and thanks to Abu Dhabi Water & Electricity Authority (ADWEA), Dubai Water and Electricity Authority (DEWA), Sharjah Electricity and Water Authority (SEW), and Federal Electricity and Water Authority (FEWA), Ministry of Environment and Water (MEW), Department of WaterUmm Quwain Government, Sharjah Municipality and Fujairah Municipality for providing the data of water production. Also, the Author would like to thank Ministry of Economics, Metrological Department for providing rainfall data. Also, I would like to thank Prof. Hasan Arman, UAE University, College of Science, Department of Geology, for his voluble comments. 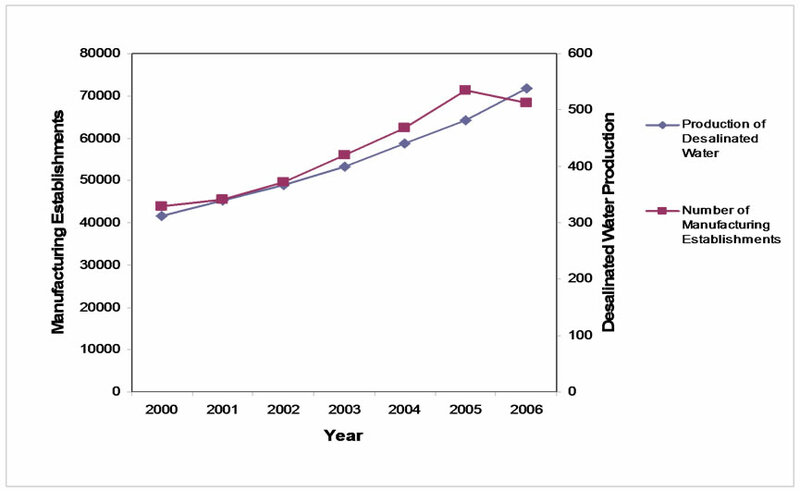 C. Sommariva and V. S. N. Syambabu, “Increase in water production in UAE,” Desalination, Vol. 138, pp. 173–179, 2001. R. Kansoh, W. M. Muller and R. Klingbeil, “Management of shared groundwater,” United Nations Economic and Social Commission for Western Asia, Hannover, 11/09/2003. Ministry of Economics, “Data sheet for the climate of UAE,” Metrology Department, Abu Dhabi, United Arab Emirates, 2007. Z. S. Rizk, A. S. Alsharhan and S. S. Shindo, “Evaluation of groundwater resources of United Arab Emirates,” In Proceedings of the 3rd Gulf Water Conference, Vol. 1, Muscat, Sultanate of Oman, pp. 95–122, 1997. G. P. Jones and S. H. Marrei, “Groundwaer resources in the united Arab emirates,” Middle East Water Sci., Vol. 6, No. 1, pp. 41–45, 1982. Ministry of Interiors, “Annual statistics group,” Abu Dhabi, United Arab Emirates, 2007. A. S. Alsharhan, Z. R. Rizk, A. E. Narin, D. W. Bakhit and S. A. Alhajri, “Hydrogeology of an arid region: The Arabian gulf and adjoining areas,” Elsevier, Amsterdam, 2001. A. A. Murad and R. V. Krishnamurthy, “Factors controlling groundwater quality in eastern united Arab emirates: a chemical and isotopic approach,” Journal of Hydrology, Vol. 286, pp. 227–235, 2004. M. Al-Rashed and M. M. Sherif, “Water resources in the GCC countries: an overview,” Water Resour Manag Vol. 14, pp. 59–75, 2000. R. L. De Jong, “Water resources of GCC: International aspects,” Water Resour Plann Manag, Vol. 115, pp. 503–510, 1989. M. S. Al Mulla, “The UAE’s successful dam management strategies,” In WaterTech, Dubai 13–14 October 2008. MEW (Ministry of Environment and Water), “Personal communications,” Dubai, United Arab Emirates, 2008. ADWEA (Abu Dhabi Water and Electricity Authority), “Annual Report of Abu Dhabi Water & Electricity Authority (ADWEA) 1998-2006,” Abu Dhabi, United Arab Emirates, 2007. Dubai Electricity and Water Authority (DEWA), “Annual Report 2006,” Dubai, United Arab Emirates, 2007. Sharjah Electricity and Water Authority (SEWA), “Official communications,” Sharjah, United Arab Emirates, 2007. Federal Electricity & Water Authority (FEWA), “Official communication,” Dubai, United Arab Emirates, 2007. J. I. Uitto and J. Schneider, “Freshwater resources in arid lands,” In: UNU Global Environmental Forum V, United Nation University Headquarters, Tokyo, Japan, 1997. MEW (Ministry of Environment and Water), “Personal communications,” Dubai, United Arab Emirates, 2007. FAO (Food and Agriculture Organization of the United Nations), “Review of world water resources by country,” Water Report 23, Rome, 2003. Water Department-Government of Umm Al Quwain, “Official Communications,” Umm Al Quwain, United Arab Emirates, 2007. World Bank, “Making the most of scarcity: Accountability for better water management in the Middle East and North Africa,” MENA development report, 2007. ADSSC (Abu Dhabi Sewerage Services Company), “Annual Report 1998-2006,” Abu Dhabi, United Arab Emirates, 2007. Statistics Center of Dubai, Dubai Municipality, Dubai, United Arab Emirates, 2007, website: http://www.statisticsdubai.ae/. Sharjah Municipality, “Official Communications,” Sharjah, United Arab Emirates, 2007. Ajman Municipality and Planning Department, “Official Communication,” Ajman, United Arab Emirates, 2007. Fujairah Municipality, “Official communication,” Fujairah, United Arab Emirates, 2007. C. W. Fetter, “Applied hydrogeology,” Prentice Hall, Inc., New Jersey, USA, 2001. A. Murad and R. V. Krishnamurthy, “Factors controlling stable oxygen, hydrogen and carbon isotope ratio in regional groundwater of Eastern United Arab Emirates (UAE),” Hydrological Processes, Vol. 22, pp. 1922–1931, 2008. Z. S. Rizk and A. S. Alsharhan, “Water resources in the United Arab Emirates,” In: Water Resources Perspective: Evaluation, Management and Policy, A. S. Alsharhan, and W. W. Wood, Eds., pp. 245–264, Development in Water Science 50, Elsevier, Amsterdam, The Netherlands, 2003. A. Murad, “Chemical and isotopic investigation of groundwater in eastern United Arab Emirates (UAE),” Western Michigan University, Kalamazoo, Michigan, PhD Dissertation, 2004. A. S. El-Mahmoudi, A. A. Murad, and S. Y. Suliman, “Geophysical and Hydrochemical Investigations of Al Foah Area, United Arab Emirates,” The University of Mansoura, Egypt, Journal of Environmental Sciences, Vol. 36, pp. 1–28, 2008. F. M. Howari, “Investigation of hydrocarbon pollution in the vicinity of United Arab Emirates coasts using visible and near infrared remote sensing data,” Journal of coastal research, Vol. 20, No. 4, pp. 1089–1095, 2004. Abu Dhabi Tourism Authority, “Official communication,” Abu Dhabi, United Arab Emirates, 2007. FEA (Federal Environmental Agency), “United Arab Emirates report on sustainable development. World Summit on Sustainable Development,” Johannesburg, South Africa, 26 August – 4 September 2002.